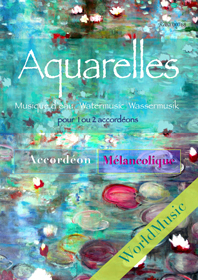 Sheetmusic of all melodies on the CD Aquarelles. Heart warming, playful, moving melodies, touching music. You 'll recognize sparkles of folk, world music, minimal music, classical, jazz and even religious music. 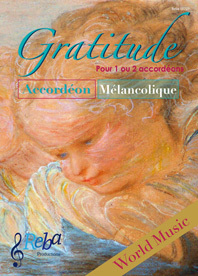 Sheetmusic of all melodies on the album "Gratitude" are published by Reba Productions Holland. (Reba727). It contains parts for one or two accordions. Click here for an example page in pdf format.You could order the albums directly from us. 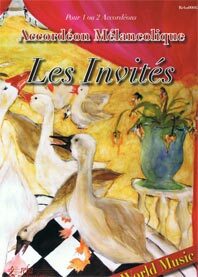 Sheetmusic of all melodies on the CD Les invités has been published by Reba Productions Holland. It contains parts for one or two accordions. Click here for an example page in pdf format. 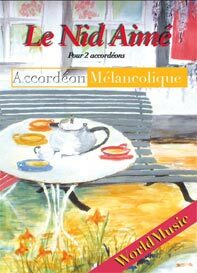 Sheetmusic of all melodies on the album "Le Nid Aimé" are published by Reba Productions Holland. (Reba648). It contains parts for one or two accordions. Click here for an example page in pdf format.You could order the albums directly from us. 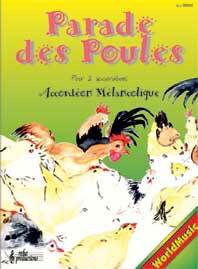 Sheetmusic of all melodies on the album "Parade des Poules" are published by Reba Productions Holland. (Reba 00508). It contains parts for one or two accordions. Click here for an example page in pdf format.You could order the albums directly from us. Their first CD "L'imparfait du Cœur", released in May of 1998 has received wide acclaim at home and abroad. (The Swedish Dragspels Nytt voted it best accordion CD of 1999.) Because of that, they were invited to play at the international Reykjavic accordion festival in Iceland (2x)and the Jyderup Accordion festival in Denmark. 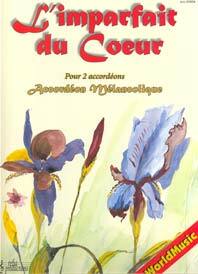 Sheetmusic of all melodies on the CD "L'Imparfait du Coeur" is published by Reba Productions Holland. (Reba 00608). It contains parts for one or two accordions. Click here for an example page in pdf format. Order this Sheet Music directly from us. 3. Download CDs with several download services like CDBABY or Amazon.com or i-Tunes. 7. Cash. Some people send cash money. Of course we don't want to encourage that. The only thing we can say is that it works ok till now. If you do, don't forget to mention the CD(s) you like to buy and your email address so we can confirm your order. You may send bank notes in your own currency, but please make sure the value equals at least the the US$ value. Send it well packed to Jean-Pierre Guiran, Georg van Saksenstraat 3, 9079 KE Sint Jacobiparochie, The Netherlands. Don't forget to mention the CDs or scores you like to order and of course you address. 8. Shops. The CDs, mentioned above are available in shops in the US and Canada, the Netherlands, Belgium, Denmark and several other European countries via our distributor Bertus in Europe and Alliance Entertainment in de USA.